Is it really that different from YOLO? In the past week, I have heard more people say "send it" than I can count. The term seems to have appeared out of nowhere and is more popular than ever. Hearing the phrase sparked my curiosity. I've attempted to discover ways to use it without looking like a fool, and I found some history behind it. 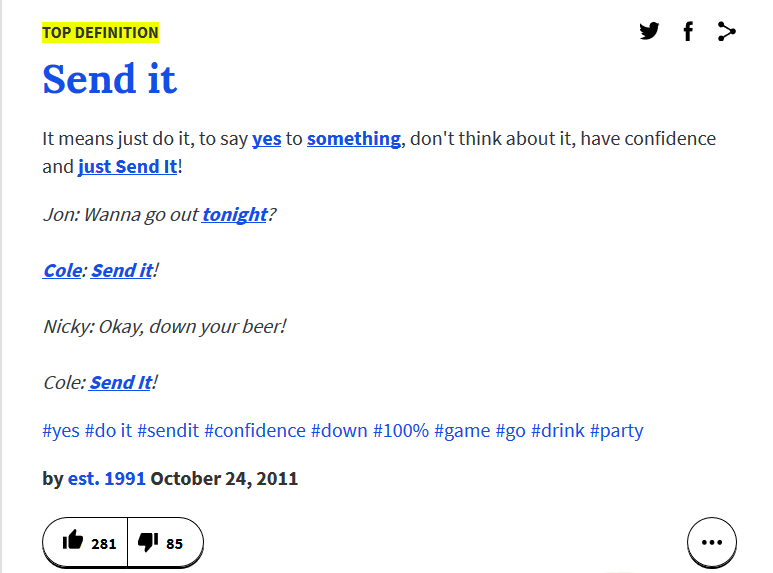 The top definition from Urban Dictionary defines "send it" as an alternative to saying yes. In my experience, "send it" is used more broadly than yes. "Just do it" and "Yolo" were popular words that "send it" can replace. To be clear, there are nuanced differences between the three terms. "Just do it" is often used with an athletic or sports-related connotation because it's Nike's slogan. It feels like I've only been using "Yolo" or you only live once ironically since 2013. Drake's song, "The Motto" came out in 2011 during the height of popularity of "Yolo." "Send it has more of carefree attitude than the other terms. Almost like saying, f**k it. Potentially where some of the popularity around "send it" originates, this March 2017 meme features Larry Enticer saying, "Are you silly? I'm still going to send it." Sendit Cabo is a company that sets up trips for college spring breaks. Sendit is the first time I ever heard it used the term used in a similar way. Next time someone asks you what "send it" means, refer them here.